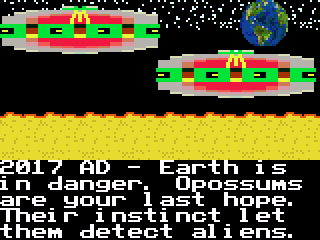 It is widely known on Youtube that opossums have the instinct to repel aliens. You can now practice your opossum massaging skills on the TI-84 Plus C Silver Edition, TI-83 Premium CE, TI-84 Plus CE, TI-Nspire CX, Android and PC platforms! The speed at which you massage the animal depends of his mood. Massaging too fast or too slow will move the cursor in the red or green and if it reaches the limits then it's game over. This is an unnoficial, spiritual sequel to Hong Kong 97 for the Super Nintendo. Donal Trump will not be featured in the ticalc.org version of the game (as per their site policies). This game is notorious for having accurately predicted a Donald Trump win at the 2016 American elections, 21 years after Hong Kong 97 did the same with Deng Xiaoping death. Opossum Massage Simulator was released 9 months prior the 2016 US elections, while Hong Kong 97 was released two years (1995) before Xiaoping's death. Cool! Is this going to be a news article? Not now, because the game isn't finished yet. This does seem like a pretty great game. I clicked on this thread expecting to see some load of Steam crap that we're all making fun of. I was horribly wrong, but I'm not sure if that's a good thing. Anyways, DJ, the game looks to possibly be... FUN! I know, sounds impossible from a game that has "Simulator" in the title, especially with the previously mentioned Steam "Simulator" games. Like I said, I'm willing to try it out, and before I do, I'm gonna say it seems to be quality, considering you're the one who's making it, and the fact that it takes a lot of effort to create a calculator game, which isn't directly sold for money. 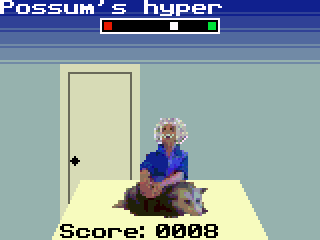 @123outerme actually the game is kinda a joke in reference to the Youtube opossum massage lady, but the story and game goal was also inspired from Hong Kong 97 and those weird Steam games. The goal was to make people think "Wow, I never thought such game would ever exist". Regarding quality, it's obviously gonna be CSE hybrid BASIC quality but it won't try to be Big Rigs. I'm pretty sure it would sell on Steam if there's a PC port. I'd like to see the possum bite your face off when you lose. I might add achievements, but not that many for speed reasons. Not much progress, but I just found my old text file that contained achievements ideas and ideas for perhaps some animations. 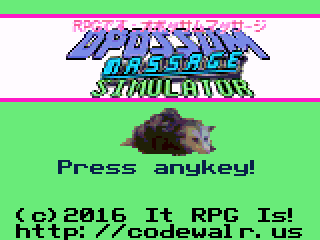 It dates all the way back in December and back then the game was called Super Opossum Massage but due to some Steam game releases in particular inspiring me, I changed the name to Opossum Massage Simulator. (even though the title has absolutely nothing to do with the game premise). Also I might scrap two of the massager sprites that are not used so far, to save space, because I would like to put a in the game for one of the achievements. Keep the possum happy for so long it does the walrii flop. And you moved this! I was just thinking, tha for a founder who makes a lot of stuff, you should probably have a subforum by now. Will you also shove "Legend of Zelda: Dark Link's Quest on a CE??" in there?